L'article a été vendu.Cet article a été vendu pour CHF 946.00. Swedish WW2 Military Officer Watch! Rare Black Dial! Top! Very nice and all original vintage 1942 Swedish military OMEGA Officer mens watch! The watch is unpolished with a stainless steel case of 30mm diameter and with screw back. 37mm from lug to lug. 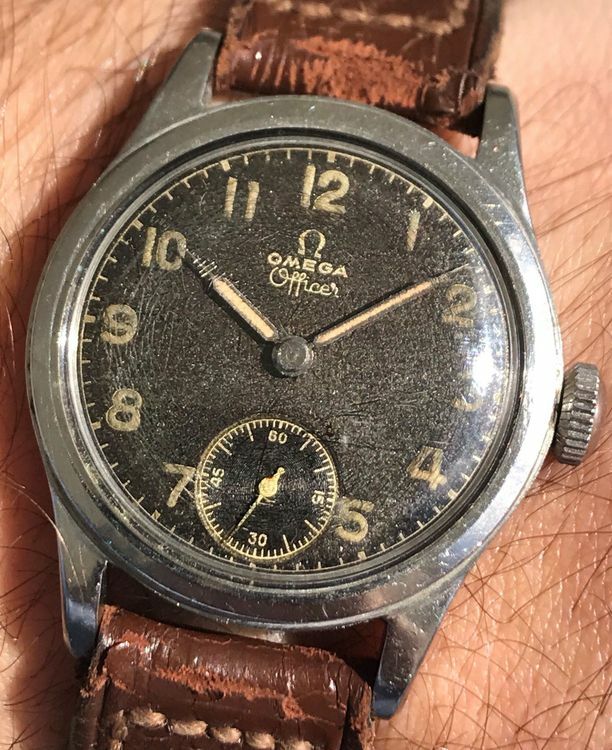 Super nice and great condition for a WWII watch. Please refer to clear pictures. Top condition! The watch works properly but has not been tested for accuracy. Seems to keep accurate time on an afternoon test! Manual-winding movement OMEGA calibre 26.5 SOT3. Stuning original *officer* black dial with arabic radium indexes! Gilt print! Comes on its original used military brown leather strap. The watch is guaranteed original and authentic OMEGA product.